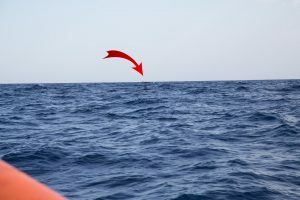 Update: Evidence for reckless behavior of Libyan Coast Guards • Sea-Watch e.V. 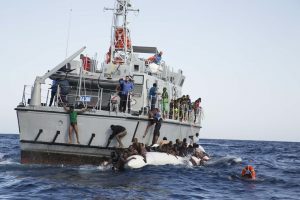 The primary goal of the Libyan coast guards was clearly to take back people to Libya and not their rescue – despite the drastic starting situation when people were already in the water (click photo 1), they did not deploy their rescue boat. 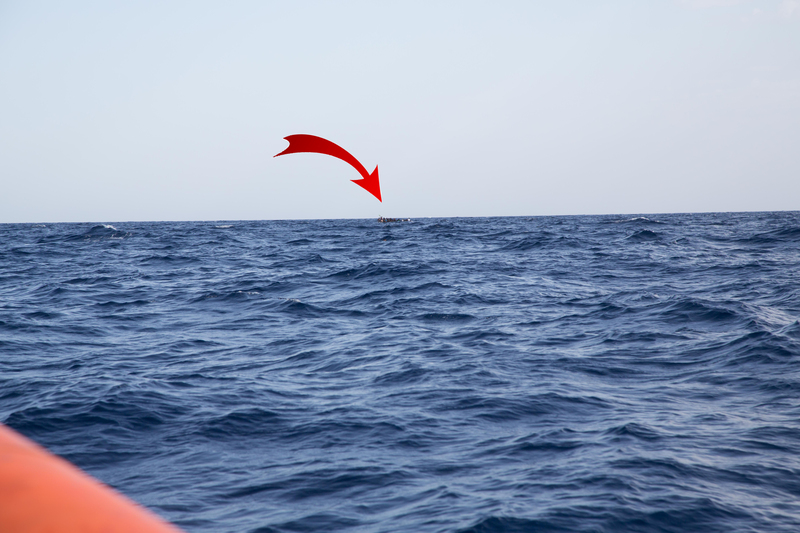 Instead, they approached the scene directly with their vessel which is absolutely inappropriate for a safe rescue procedure (photo 2) – even though our rescue boats were already on their way. 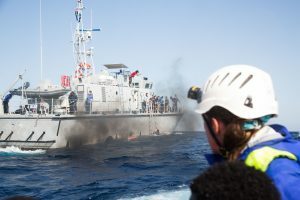 The heavy Libyan patrol vessel thereby nearly overrun the rubber boat in distress (photo 2) causing an extremely dangerous situation for those on board: In the photo, you see that the back of the distress boat is already below the stern of the Libyan vessel. Many of the refugees then jumped into the water. Rubberboats as the one in question are very instable, especially if some of the tubes are already defleating. In such cases it is paramount for a safe rescue to stay away with bigger vessels but to carry out a calm and safe rescue with small rescue boats. 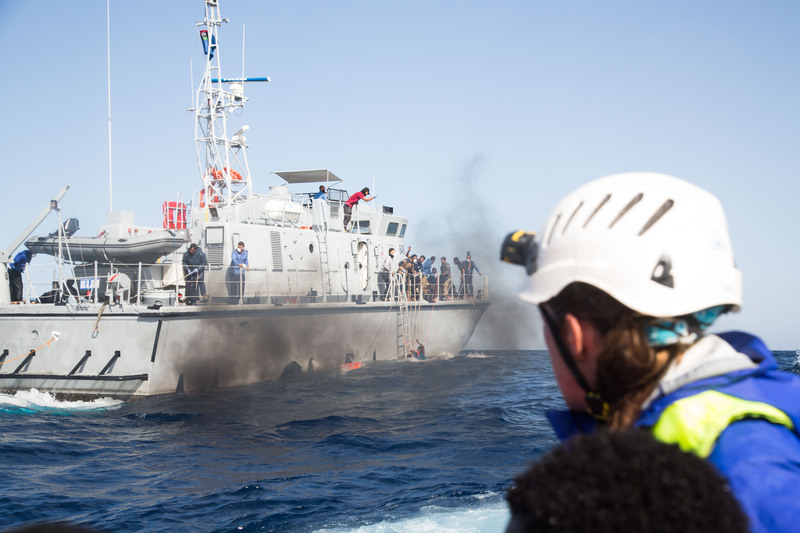 With the 2 fast rescue boats of the Sea-Watch 3, the tenders of the french warship and the rescue boat, the Libyans did not use, a safe and calm rescue could have been done, instead the Libyans decided to move in and to cause chaos. Indeed they saved some people out of the water then but they rather climbed the ship them selves in fear of their lives (photo 2). 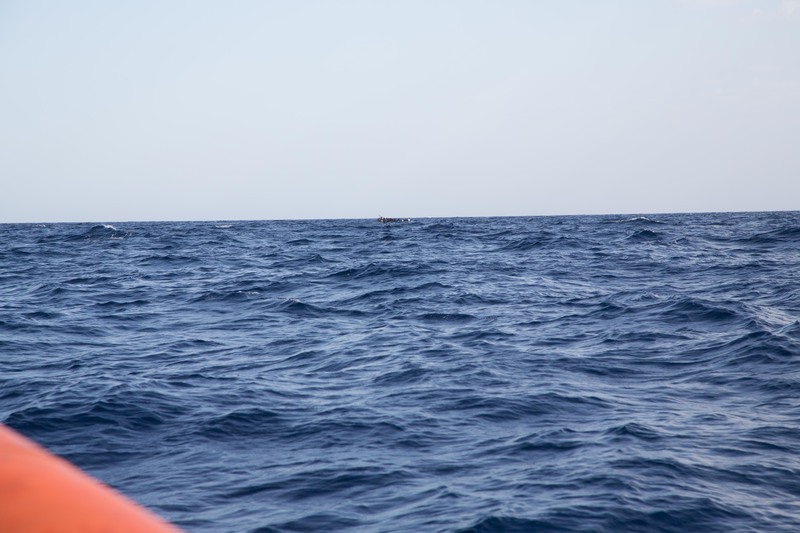 Many of the Libyan Coast Guards are standing around on their vessel instead of doing everything to save those in the water. 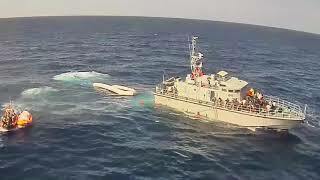 Libyan coast guards speed up their vessel while a man is still clinging to starboard side (video above), a life threatening situation. An Italian Navy helicopter even had to intervene directly to prevent a further fatality (video on Twitter). 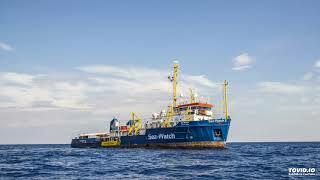 00:00:15 Sea-Watch, Sea-Watch this is warship, do you read me?